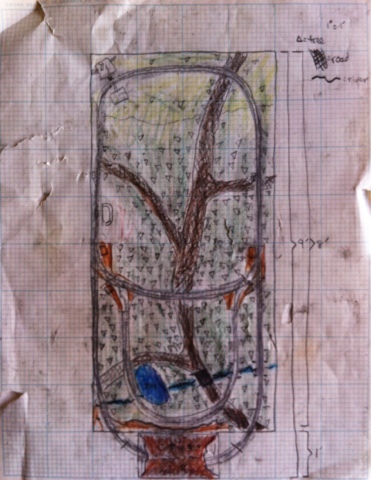 Over the weekend I stumbled across what I'm pretty sure is my earliest landscape design. This actually was a plan for my model railroad and dates back 30 years or so, long before I knew what a landscape architect was; and while it's not quite the rendering quality I strive for today, I'm pleased to see it includes several fundamentals: a drawing scale, dimensions, and a symbol legend. Why do those matter? Well, because the purpose of a landscape design is to communicate an idea; and if you can't interpret the plan you can't get the idea. A drawing scale, for instance, tells you whether what you're looking at is straight out of Stonehenge, or Spinal Tap. On my railroad plan, I noted 1"=1' : one inch (on paper) represents one foot (in real life). This scale worked because I was designing such a small area (9' x 4'), but it would be more typical for a detail drawing—for instance, to show the end cut pattern for an arbor beam, or a close-up view of an intricate tiling pattern on a patio. For a full residential landscape, a typical scale might "zoom out" to be more like one inch represents four feet. This is too far away to show precise details like the end cuts on an arbor, but still close enough to show the overall idea with some specificity. By convention, you'll usually see this written as 1/4 inch equals one foot, or 1/4"=1'-0". Purists would call this "48 scale," because 1/4"=1' is the same ratio as 1"=48", or 1:48. Other common architectural scales include 1/8"=1' (96 scale) and 1/2"=1' (24 scale). For larger sites, the scale might zoom out farther, to an engineering scale such as 1"=10', 1"=20', 1"=100' or more. This shows more of our site in every square inch, which allows the full site to be documented on one sheet of paper, but at the expense of including detail. At 1"=100' you would know that an area is paved, but you would not see a 2' x 2' paving pattern. In the past 30 years I've also learned it's not enough to only write the scale: we should show it graphically as well. This usually takes the form of a checkered bar or a zigzag line, and it's included so that if the plan falls into the hands of someone who doesn't have a scale ruler—or if the plan gets reproduced at a larger or smaller size—the reader can still see how big a foot, or four or eight, should be, and interpret the design properly. There's actually a lot more to say about scales: how to pick the best scale for your drawing, which scales to avoid and why, and how to switch gracefully between different scales. If you'd like me to write more about any of it, please chime in. And if you have a scale ruler of your own, check out this handy tutorial by FEMA.